13 Network - A collection of case information from participating trustees. Administrative Office of the U.S. Courts: Official Bankruptcy Forms - Bankruptcy pleadings and forms. America's Bankruptcy Courts - General overview of Chapter 7 complete dismissal, Chapter 11 wage earners plan, and chapter 13 reorganization. American Bankruptcy Institute (ABI World) - Daily bankruptcy news, statistics, legislative updates, and information on bankruptcy professionals and how to file. Annual and Quarterly U.S. Bankruptcy Statistics - Filing statistics from ABI World. Bankruptcy: An Overview - Introduction and resources presented by Cornell Law School. Bankruptcy and Liquidation Asset Bulletin Board (BLABB) - Nationwide database of distressed bankruptcy assets subject to sale. Bankruptcy Center - From Nolo. Everything you need to know about bankruptcy (Chapter 7 bankruptcy and Chapter 13 bankruptcy), as well as other alternatives for managing your debt. Bankruptcy Courts - Maintained by FindLaw. Bankruptcy Rules - Bankruptcy rules and official forms; Bankruptcy Rules Committee. 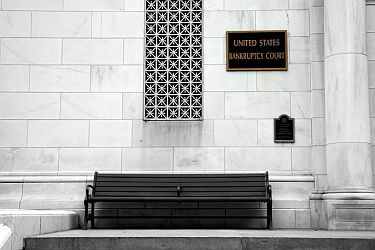 Bankruptcy Statistics - The Administrative Office of the U.S. Courts compiles statistics on bankruptcy filings for each quarter ending December, March, June and September. The fiscal year for the federal Judiciary ends September 30. The calendar year ends December 31. Quarterly and 12-month statistics are available approximately 2 months after the close of a quarter. Additional bankruptcy statistics are available on the Public Access to Court Electronic Records (PACER) system. BankruptcyData - Bankruptcy research reports, bankruptcy research center, bankruptcy courts listing, recent filings, bankruptcy news. California Bankruptcy Forum - Educational and networking resources for bankruptcy and insolvency professionals in the State of California. Corporate Bankruptcy: What Every Investor Should Know - Backgrounder provided by the SEC. Credit Manager's Association of California - Resource for credit and financial management. Provides information, products and services for accounts receivable management. Detroit Bankruptcy, The - Report (Nov 2013) on the City of Detroit's bankruptcy by Wallace C. Turbeville, Senior Fellow at Demos. EDI - For high-volume recipients (200 or more notices per week) who want to automatically process data using computer database to computer database transfers. Fax - For recipients who don't want to set up an Internet e-mail account, but want to eliminate mail pieces. Internet E-Mail - For recipients who want the speed and convenience of receiving notices on line. Enron Corp. Bankruptcy Information - Documents filed in the Enron bankruptcy case available online. Enron Creditors Recovery Corp. - Sole mission is to reorganize and liquidate the remaining operations and assets of Enron following one of the largest and most complex bankruptcies in U.S. history. Federal Judiciary - Publications, directories, news releases, updated vacancy listings, employment opportunities, and other information. Directory of all federal courts in U.S. at the Court Locator page. FindLaw: Bankruptcy - Message board, mailing list, documents, articles, books, bankruptcy law web. InterNet Bankruptcy Library - News, bankruptcy professionals, periodicals, books, conferences, mailing lists. Kelly Blue Book - Pricing reports for new and used cars. National Association of Bankruptcy Managers - Addresses the needs of the bankruptcy trustees throughout the country and promotes the effectiveness of the bankruptcy system as a whole. National Association of Credit Management (NACM) - NACM represents business credit grantors in manufacturing, wholesaling, service industries and financial institutions. New Generation Research, Inc. - Publishers of bankruptcy and distressed securities research publications The Turnaround Letter, and Bankruptcy Yearbook and Almanac. Official Bankruptcy Forms - Forms provided by U.S. Federal Judiciary. PACER - The Federal Judiciary's centralized registration, billing, and technical support center for electronic access to U.S. District, Bankruptcy, and Appellate court records. See PACER Web Links for links to courts that provide case information on the Internet supported by the PACER Service Center. Courts that do not provide case information on the Internet may offer direct dial-up service. Also, check the respective court's homepage for this service at the Court Locator. Title 11 U.S. Bankruptcy Code - From Cornell Law School. Title 11 U.S. Bankruptcy Code. U.S. Bankruptcy Courts - Official site. Federal courts have exclusive jurisdiction over bankruptcy cases. Bankruptcy cases cannot be filed in state court. Each of the 94 federal judicial districts handles bankruptcy matters. U.S. Bankruptcy Court News - From Bloomberg. U.S. Trustee Program, Department of Justice - A component of the Department of Justice responsible for overseeing the administration of bankruptcy cases and private trustees under 28 U.S.C. §586 and 11 U.S.C. §101, et seq. It consists of 21 regional U.S. Trustee Offices nationwide and an Executive Office for U.S. Trustees (EOUST) in Washington, D.C. This site contains information about the United States Trustee Program and the federal bankruptcy system. When Cities go Bankrupt - Information provided by The Third Branch News. Chapter 9 filings are not common. From 1991-2012 there were 217 Chapter 9 bankruptcies filed nationwide, with 20 filed in FY 2012. The majority of the cases have been for utility districts and not sovereign government entities. This map shows total Chapter 9 bankruptcies by district from 1991 to 2012. Learn more about Chapter 9 and bankruptcy basics on the United States Courts website. World Internet Insolvency and Bankruptcy Resources - Companies and assets for sale, auctions, auctioneers, government auctions, company information, credit and debt collection, bankruptcy, insolvency law, lawyers.